Existing analysis and design techniques to quantify serviceability member deflection of reinforced concrete (RC) beams are generally built on two major premises: (1) full interaction through the use of moment curvature approaches; and (2) a uniform longitudinal shrinkage strain εsh within the member to simplify the analysis. Both premises are gross approximations. With regard to the first premise, RC beams are subject to flexural cracking and the associated partial interaction (PI) behaviour of slip between the reinforcement and adjacent concrete. Furthermore with regard to the second premise, numerous tests have shown that εsh varies along both the width and depth of the beam that is, it is far from uniform. Hence the quantification of the serviceability deflections of RC beams for design is subjected to two major sources of error: that due to the PI mechanisms which occur in practice; and that due to the time dependent material properties of shrinkage and creep. This paper deals with the development of PI numerical mechanics models with non-linear shrinkage strain variations required to simulate the PI behaviour of RC beams in order to considerably reduce the source of error due to the mechanics model. This new mechanics model will allow: the development of appropriate design mechanics rules for serviceability deflection; and also assist in the better quantification of creep and shrinkage by removing the existing mechanics source of error. 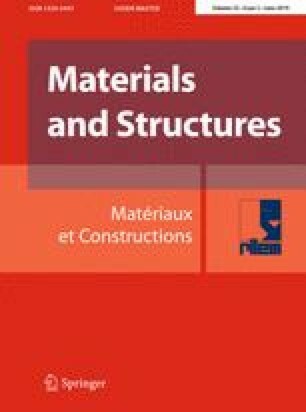 Specifically, this paper describes a numerical approach for quantifying the deflection of RC beams that not only allows for the PI behaviours of flexural cracking, crack spacing and reinforcement slip but also allows for the variation in the longitudinal shrinkage strains along both the depth and width of the member. The analysis is also compared with time dependent test results of six RC beams tested by Gilbert and Nejadi (An experimental study of flexural cracking in reinforced concrete members under sustained loads. UNICIV Report No. R-435, School of Civil and Environmental Engineering, University of New South Wales, Sydney, Australia, 2004) under sustained loading conditions for the period of 400 days and the predicted deflection of RC beams have shown conservative estimates with the measured deflections. The online version of this article ( https://doi.org/10.1617/s11527-019-1350-0) contains supplementary material, which is available to authorized users. The authors declare that there is no involvement of any human participants and/or animals to conduct this research. The authors also declare that all authors are aware about this manuscript to be submitted in this journal.